Luton boss Mick Harford is in the running to be named League One Manager of the Month for February after being nominated for the award once more. The former Town striker, who took over in January when Nathan Jones left for Stoke City, was pipped for that honour by Scunthorpe boss Stuart McCall. Harford then led Hatters to three wins from four last month, taking 10 points from a possible 12, with victories over Shrewsbury, Wycombe and Fleetwood, while also drawing against Coventry as well. 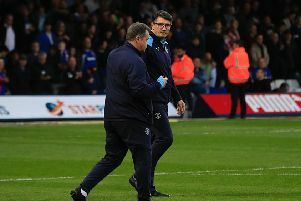 His nomination read: "Uncomfortable with taking credit for a side he inherited, Harford won’t be able to downplay his impact on the Luton team much longer if they continue to cast aside opponents. "Ten points from four games says they will." Harford is up against Derek Adams (Plymouth), Jack Ross (Sunderland) and Daniel Stendel (Barnsley), with the winner announced on Friday morning.